"You see how it's so smooth? That's the first rule," says Payard as he leans over a glass bowl, stirring an egg white into a blend of almond flour and powdered sugar. He's showing Wu how to make a macaronade, the base for the meringue sandwich cookies called macarons. Wu is a gifted fashion designer (he created the inaugural gown for Michelle Obama) and an ambitious home cook. But the one time he made macarons, he mistakenly used almond paste instead of almond flour, rendering them fatally lumpy. Wu has established through careful research (a lot of macaron-eating) that his favorite macarons are Payard's (available at Payard Pâtisserie & Bistro in Las Vegas). So he leapt at the chance for a lesson with two friends, the stylist Kate Young and the Estée Lauder model Hilary Rhoda. Macarons consist of a layer of filling sandwiched between meringues that are miraculously tender, crunchy and ethereal all at once. 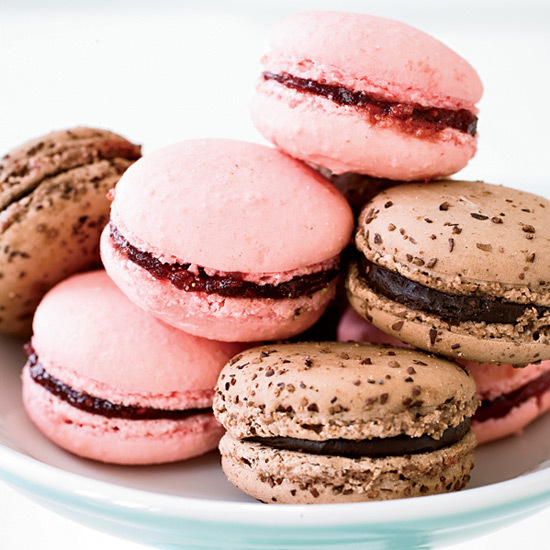 Not to be confused with macaroons (egg whites folded with shredded coconut or grated almonds), the modern French macaron is credited to the Parisian pastry shop Ladurée. 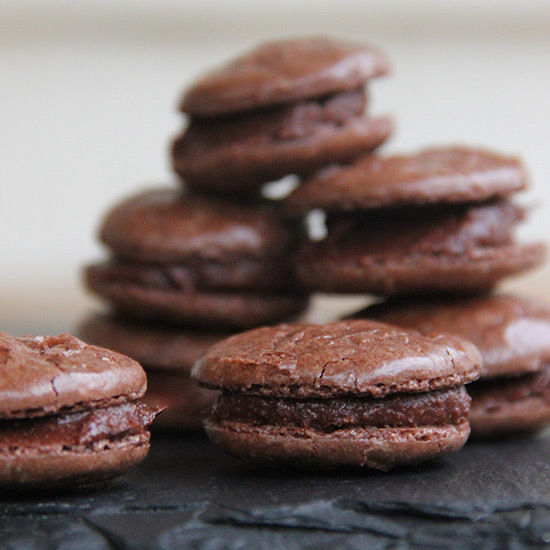 Macarons are mistakenly thought to be hard to make. But, as Payard explains, they require only four things for success: a smooth macaronade, a fluffy meringue, attentive baking and plenty of filling. Payard turns on his standing mixer to whip the meringue. Wu asks if he can use a handheld mixer at home. "Sure," Payard says. "Just don't overbeat the egg whites." Payard pours hot sugar syrup into the fluffy whites, turning them glossy and sleek. Then he helps Wu fold them into the macaronade, turning the bowl with his left hand while working the spatula with his right. 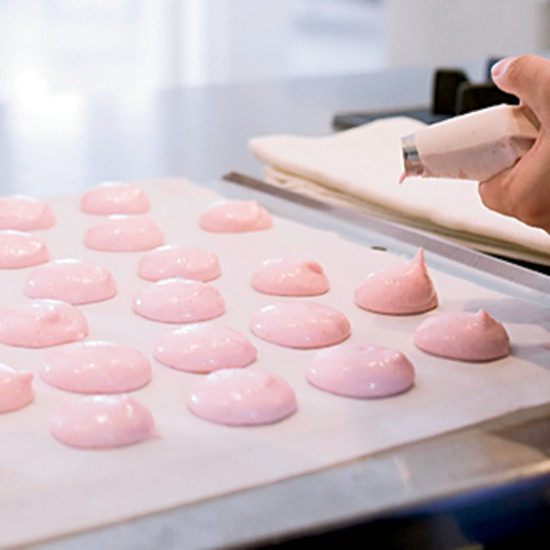 Many chefs think they must pipe the meringues into perfect rounds to avoid dreaded peaks. But this kind of piping takes years of practice. Payard shows Wu a smarter way: He pipes them out roughly, taps the tray on the table a few times, then lets them dry for anywhere from 15 minutes to an hour, depending on the humidity. The tapping and drying give the cookies a protective skin and allow them to settle into perfect rounds all by themselves. "Okay," Payard says. "Now I will show you how to bake them." After sliding the macarons into the oven, Payard shuts off the heat for a few minutes, then turns it back on to finish the cookies. "They turn brown if you leave the oven at the same temperature the whole time," he says. His emerge vividly pink. Payard helps Wu and his friends spread raspberry jam onto the meringues. "No filling, no flavor!" he coaches. Wu takes a bite. The macaron collapses and shatters into a perfect crunchy-creamy bite. "I'm making these next week," Wu says. "I'll send you a picture so you can see how smooth they are."